There’s a place near me called Vegan Treats I’ve been wanting to try for a while, so today my friend and I spontaneously decided to go. Vegan Treats prides themselves on everything being “cruelty free, dairy free, cholesterol free, 100% vegan, and 100% delicious.” They also have gluten free options available. Some people get weirded out by the concept of vegan food, but I love it and think most of it is as good as non-vegan food. I had heard great things about Vegan Treats so I was excited to finally be going. When I first walked in, I was overwhelmed – everything on display looked so good! I didn’t know where to begin but I knew I wanted to try everything. I took a look at their menu, which is pretty extensive, but they don’t always carry everything on it (you have to preorder if you want something specific). I wanted to try to coconut cream cupcake but they only had the black bottom cream cheese cupcake in stock today, so I went back to looking at the mini cakes. The mini coconut cream cake looked so tempting, but it was pretty big and I knew I wouldn’t be able to restrain myself from eating it all in one sitting (I’ll need to go back another time and try it if I have somebody to split it with…or maybe just eat it all by myself). 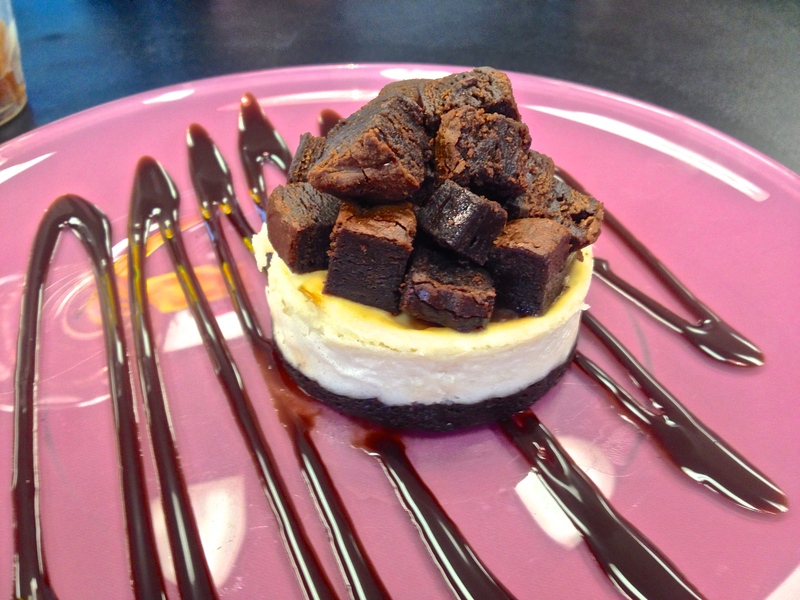 I spied the mini brownie chunk cheesecake and decided to get that. I couldn’t have been happier with my decision. It tasted just like a cheesecake and the little brownie bite chunks on top were so good. The chocolate drizzle on the plate was great to add even more chocolate to each bite. If I gave this to somebody without telling them it was vegan, they wouldn’t have guessed. I happily devoured it. My friend got the black bottom cream cheese cupcake, and I took a bite of it. It was good but it didn’t have frosting on it, and I think frosting is the best part. There was even a little dab of frosting in the middle of my cheesecake underneath the brownie mountain. They have a wide variety of desserts. They offer buns, whoopie pies, truffles, french pastries, bombs, cupcakes, cakes, pies, doughnuts, cannolis, soft serve ice cream, cookies, and brownies. They also have many flavor options for their desserts. While I was sitting there eating my mini cake, one dessert caught my eye. It appeared to be a plain glazed doughnut with something on top of it, and then a little waffle on top of that. I inquired as to what it was and the gentleman said it was soy chicken – so a variation of fried chicken and waffles on a doughnut. According to the man it is a popular choice and everybody enjoys it. It’s slightly pricey but that’s to be expected from vegan food establishments. My dessert was worth every penny though, and I definitely plan on going back sometime for seconds.